Some terrifying cults are so well-known they can be described with a single word: Manson, Waco, Jeffs, Jonestown. Others may not be as iconic—at least in America—but still provide plenty of nightmare material. Here are five examples, all of which made made screaming headlines during their flashes of notoriety, but have seldom been heard from since. In March 1989, a University of Texas student named Mark Kilroy went missing while on spring break. He’d been staying on South Padre Island, but on the night in question, he’d ventured across the border to Mexico to check out the bar scene, where he vanished without a trace. Four weeks later, his grisly fate was revealed. As People reported at the time, his brain was found first. It turned up in a black cauldron, and it had been boiled in blood over an open fire along with a turtle shell, a horseshoe, a spinal column and other human bones. His ritual death and dismemberment had been carried out in service to religion—a bizarre, drug-demented occult religion practiced by an American marijuana smuggler operating out of Mexico. Authorities were led to a grave containing Kilroy’s body, or at least what remained of it, and after that the uncovering of mutilated corpses went on and on. 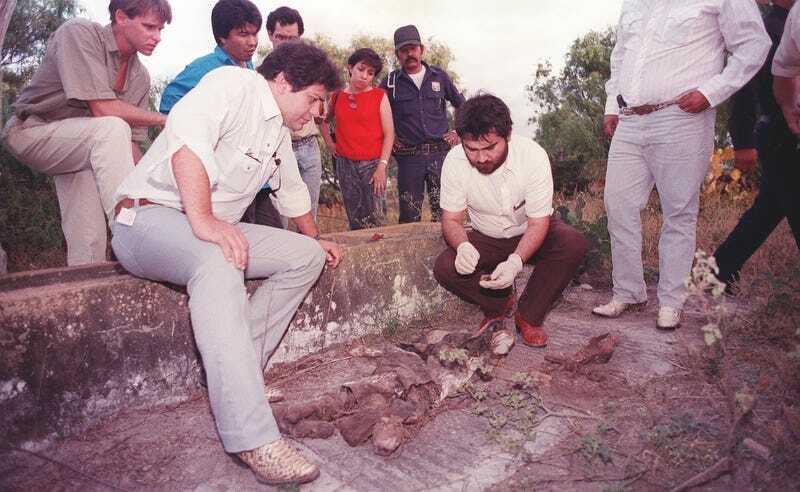 The first day of digging brought up a dozen bodies, all of them buried on the grounds of Rancho Santa Elena ... the victims had been slashed, beaten, shot, hanged or boiled alive, the only commonality to their deaths the ritual mutilations that followed. The drug smugglers believed that human sacrifice would somehow magically protect them from being caught by the police, and even make them bulletproof. They were mistaken. Their downfall came when a man tied to the cult was nabbed for running a roadblock—an offense that worsened when he was found to have weed on him. In search of a bigger bust, and looking for clues in the Kilroy case, cops ventured to the farm belonging to the man’s family, the infamous Rancho Santa Elena mentioned above. The man who’d convinced his followers to join in his madness—the bodies found at Rancho Santa Elena were just some of the casualties—was “El Padrino,” the Godfather (his real identity: he was 26-year-old Adolfo de Jesus Constanzo), with help from 24-year-old Sara Aldrete, a.k.a. “the Witch.” Rolling Stone’s in-depth investigation of the case (excellent reading if you’re not faint of heart, as is this Texas Monthly take on the story) quotes an anthropologist as calling Constanzo “the Pied Piper of death.” Costanzo had grown up in the Santería religion, but his beliefs had morphed into something far darker, of his own design, as he gained more power. Costanzo eluded capture until 1989, when he ordered an underling to shoot him and his longtime companion, Martin Quintana Rodriguez, rather than be taken alive by police. Aldrete (a well-liked college student just across the border in Texas who denied knowing anything about any murders) and other members of the cult were arrested and charged with a multitude of crimes, including homicide. The “killing shack” where Kilroy and others were victimized was burned by law enforcement after being purged of its black magic spirits in a special ceremony. Formed in 1984 by Joseph Di Mambro and Luc Jouret, with followers in various countries including Switzerland, France, and Canada, the group that would come to be known as the Order of the Solar Temple drew inspiration from a variety of sources, including the Rosicrucians and the Knights Templar. Over time, the group’s beliefs shifted away from New Age spiritualism and became increasingly doomsday-focused and paranoid. Jouret, a doctor, was the face of the organization, delivering the lectures that—despite warning of the looming environmental apocalypse—were magnetic enough to attract new followers. Di Mambro managed the group’s finances, which grew impressively as the membership, comprised mostly of middle and upper-class people, grew to an estimated 400. The Solar Temple, which bounced between headquarters in Switzerland and Canada, saw its fortunes decline in the 1990s; there were high-profile defections, gun charges, and allegations of sexual misconduct. In 1994, the group made good on its belief that members would need to ascend to a different spiritual plane in order to survive the environmental apocalypse and be reborn on a planet orbiting the Sirius, the Dog Star. Their method of transformation? Fire. The next morning investigators were baffled by much of what they discovered at the sites—48 people dead. Some may have committed suicide while others were most likely killed. Some had been injected with tranquilizers or had plastic bags over their heads while others were shot. Di Mambro, his wife and children, and Jouret were among those killed. And the tragedy didn’t end there; in December 1995, a chalet in the Swiss Alps was found burned with 16 bodies inside, most of which had been killed prior to the fire. In 1997, five more members perished in a Quebec house. Counting the Dutoit family, and the subsequent suicide of the Solar Temple duo who’d killed them, the mysterious cult’s death toll stands at 74. Also in 1997, the unusually bright Hale-Bopp Comet blazed a spectacular sight in the night sky. While its appearance thrilled astronomers, it also brought a most unexpected tragedy—another mass suicide tied to cosmic beliefs. This time, it was a cult called Heaven’s Gate that had taken up residence in a Rancho Santa Fe, California mansion. Unfortunately, heading to space came with a mighty price, and ghoulish photos of dead cult members, ritualistically draped in dark purple shrouds and clad in Nikes, soon flooded the news. In three waves, members ingested a poisonous mixture of barbiturates and alcohol, and as their breath slowed and bodies shut down, they asphyxiated under plastic bags that they had tied over their heads. Members followed guidelines they had researched several years earlier, and laid down their earthly lives in what can only be called ritual precision and attention to detail ... Members of each wave had cleaned and tidied after their compatriots had died, removing the plastic bags and draping [shrouds] over their deceased companions. Asahara preached that the end of the world was near and that Aum followers would be the only people to survive the apocalypse, which he predicted would occur in 1996 or between 1999 and 2003. Aum accumulated great wealth from operating electronic businesses and restaurants ... [he] recruited young, smart university students and graduates, often from elite families, who sought a more meaningful existence. After a mind-boggling eight years on trial, Asahara was sentenced to death by hanging; he is still on death row. Throughout the process, he “refused to answer questions and has never made more than confusing comments,” the New York Times wrote, though it’s believed the group was motivated by wanting to thwart authorities from shutting down the group, in addition to jump-starting the apocalypse. At the time of the attack, the group had tens of thousands of followers in Japan and Russia. Despite the attack, Aum was never banned in Japan. While it was outlawed in Russia and designated a terrorist organization by several countries, Japan opted instead to keep the group under strict surveillance ... the group did lose its religious status and was forced into bankruptcy by compensations payments to the victims of the attack. But it lives on in two new offshoots, Aleph and Hikari no Wa, which have an estimated 1,500 followers. They claim to have disavowed Asahara, but many Japanese remain deeply suspicious of their activities. “Russian Doomsday Cult Coaxed Out of Cave” has to be one of the most chilling headlines ever written. It topped a USA Today story reporting the events of November 2007, in which officials in a frozen wooded area near the Volga River were desperately trying to lure dozens of people from the underground lair they’d moved into to prepare for the apocalypse, which they believed would come in spring 2008. Complicating matters: the group’s stated intention to blow itself up if necessary. Self-declared prophet Pyotr Kuznetsov, who established his True Russian Orthodox Church after he split with the official church, blessed his followers before sending them into the cave earlier this month, but he did not join them himself. He was undergoing psychiatric evaluation Friday, a day after he was charged with setting up a religious organization associated with violence ... Kuznetsov said his group believed that, in the afterlife, they would be judging whether others deserved heaven or hell ... Followers of his group were not allowed to watch television, listen to the radio or handle money, media reports said. Despite the past-tense phrasing of that USA Today hed, the True Russian Orthodox Church held on for months despite increasing dangers that their cave stronghold would collapse. In March 2008, the BBC reported “fresh talks were underway” to draw out the congregation. Ultimately, an apocalypse on a much-smaller scale eventually forced the women above ground. Here’s a bookend headline, this time from an Australian news source: “Corpse Stench Drives Russian Doomsday Cult from Cave.” With two dead members left decomposing in the enclosed space, the nine final faithful decided leaving the cave and facing the end times in the open was preferable to perishing from toxic fumes. Details on Kuznetzov’s fate are unclear, though it seems he attempted suicide once his doomsday prediction failed to come true; he was also slapped with a variety of charges, including “the creation of an organization infringing upon citizens’ rights.” Reports seems to indicate that he may still be confined to a psychiatric facility, having not yet been deemed mentally fit to stand trial.